Obituary for Rita Ann (Golinsky) Chester | McDonald-Aeberli Funeral Home, Inc.
Rita Ann Chester, age 85, of Mars, PA, formerly of Freedom and Port Washington, N.Y., passed away on Wednesday evening September 12, 2018 at RoseCrest Assisted Living in Mars, with her family at her side. Born in Hempstead, N.Y., on March 15, 1933, she was the daughter of the late Michael and Anita Schultz Golinsky. 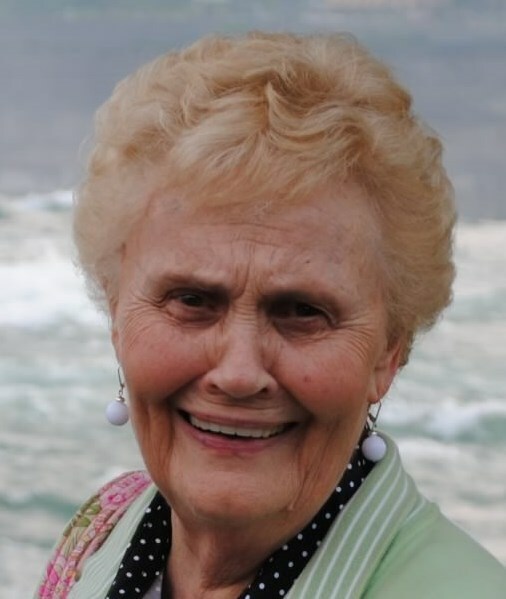 Rita had been a bookkeeper for Nielson and Associates Insurance, Manhasset, N.Y.
She was a member of St. Ferdinand’s Church in Cranberry Twp., PA.
She was on the Board and a lifetime member of the Port Washington CancerCare Chapter. She was active with the Red Stocking Review, which is a large CancerCare fundraiser. Rita was a member of the Port Washington Columbiettes Auxiliary #1227 in New York for over thirty years, where she held several officer positions, including Recording Secretary, Vice-President and President. She spent years on the Board of the Nassau County Columbiettes as she worked her way up to the District Deputy. She became President of the Nassau Chapter, while overseeing the eleven auxiliaries in the County. Surviving are her husband, Michael Chester, Jr., who she married on September 13, 1958, two daughters, Michele Yung (Michael) of Hopewell Twp., PA. and Mary Beth Chester (Cheryl Ann) of Cranberry Twp., two sons, Christopher Chester (Darcy Beeman) of Kent, N.Y., and Robert Chester (Jill) of Mooresville, N.C., her grandchildren, Cassidy Beeman (Josh Sciandra), Gabrielle, Michella and Nicolette Chester and Rachel, Matthew and Thomas Yung, her great grandchildren, Evey and Lucy Sciandra, a sister, Carolyn Gerzack in N.Y., three brothers, Arthur Golinsky (Joan) in CT., Michael Golinsky (Andrea) in N.Y., and James Golinsky in FL., also several nieces and nephews. Friends will be received at the McDonald-Aeberli Funeral Home, Inc., 238 Crowe Ave. Mars, PA 16046 on Saturday from 1-4:00 PM. A Blessing Service will be held at 2:00 PM at the funeral home. Additional visitation and a Mass will be held in New York. Burial will be in Nassau Knolls Cemetery. Memorials may be made to the Port Washington Chapter of Cancer Care, the Alzheimer’s Association Great Pennsylvania Chapter, or Lutheran Senior Life, St. John Community, Mars, PA 16046. Directions and condolences are available at www.mcdonald-aeberli.com.